Bring a gaming console or smart TV to campus? The PittNet Gaming Network provides wired and wireless access needed for online gameplay in residence halls, along with network access for other devices that cannot store a username and password. Register your device, then connect using the method that is most convenient for you: plug into the wired network in your residence hall room on the Pittsburgh campus and the University of Pittsburgh at Johnstown or choose the convenience of the PITT-GAMING wireless connection available on all campuses. As a student living in a residence hall, you can register one device. A device can be registered for either the wired or Wi-Fi network. Wired network connections are available in the residence halls on the Pittsburgh campus and Pitt-Johnstown. Some advanced features, like screen sharing, may not function properly. Service areas may be limited on the Titusville campus. Choose which device to register from many gaming system and smart TV options. Enjoy fast, secure, easy-to-use gaming access from residence hall locations on all campuses. Connect to the gaming network at no additional cost. The University allows only one device per resident student to connect to the PittNet Gaming Network. You can switch devices by completing the registration and configuration process again. Each device that can connect to the internet features a unique address, much like a serial number set by the manufacturer. This address is known as the physical address or MAC address. If your device can connect to a network both wired and wirelessly, it will have a different MAC address for each of these connections. To connect to the network you need the MAC address of the device you would like to use. If your device supports both wireless and wired connections, make sure that you get the MAC address corresponding to the connection method you will use. How Do I Determine My Device's MAC Address? Note: Apple prints the MAC address for both wireless and wired (Ethernet) connections on a label on the Apple TV box. Follow these instructions if you do not have access to the box. Power up the unit and use the up and down arrow keys to navigate to the Settings menu. Click the round center button inside the directional buttons to open the menu item. The About option should be highlighted. Click the round button to open this menu item. The MAC address of the Apple TV's wireless network interface should be listed as Wireless ID. The MAC address for the Apple TV unit's wired connection will be listed as Ethernet ID. Record both addresses in case you wish to switch registration from wired to wireless, or vice versa. From the home menu, tap the "System Settings" menu tile (the wrench icon). Select Internet Settings, Other Information, then Confirm MAC Address. The system's MAC address should display as "MAC Address." The system's MAC address should display on the "Internet Settings" window as "System MAC Address." Select Settings from the row of icons running across the top of the display. Select the System Settings tile. Navigate down to System Information. Your unit's MAC address should display on the following window. Power on your system without a disk in the drive. The menu should appear. Select Settings, System, then System Information. Two MAC addresses (LAN Cable and Wi-Fi) should display on the following window. "LAN Cable" is the unit's wired (Ethernet) MAC address and "Wi-Fi" is the wireless MAC address. Record both of these addresses in case you wish to switch registration from wired to wireless, or vice versa. Navigate to Settings, System Settings, then Network Settings. Select the Wired Network tile if you intend to connect your unit to your residence hall room's network data port using an Ethernet cable. Select the tile for the PITT-GAMING network, that should be visible, if you intend to connect via wireless. Select Configure Network, Additional Settings, then Advanced Settings. The MAC address for the wireless or wired (Ethernet) adapter in the Xbox 360 unit should display on the following window. A. Your Xbox unit tries to connect to a network as soon as it is powered on. Let your Xbox run through its system setup routine and any additional Fix It option. After these setup attempts run, your Xbox should prompt you to manually set up the networking. Some Xbox versions will display two MAC addresses on this window–one for wired (Ethernet) and one for wireless. Some Xbox systems use only one MAC address. Document the displayed address or addresses, including the proper labels. B. You see the main Xbox console. Select My Games & Apps if you are signed into a profile. Select Settings, Network, then Advanced Settings. Two distinct MAC addresses (one for "Wired" and one for "Wireless") should display. Record both these addresses in case you wish to switch registration from wired (Ethernet) to wireless, or vice versa. For other device instructions, use an internet search engine like Google. Once you have your device's MAC Address, register it with Pitt Information Technology. Log in to the My Pitt website. Select Profile, Manage Your Account, then MAC Address Registration Request. Fill out the registration form, then click Submit Request. Pitt Information Technology will process this information and you will receive an email confirmation that the MAC address of your device is registered to use the PittNet Gaming Network. Requests are usually processed within 24 hours. Plug the cable into the ports for your device and your room's network port, then turn on your device to test connectivity. How Do I Connect Using Wireless? Power up or restart your Apple TV. When it does not sense an active wired network connection, it will prompt you to attach to available wireless networks. Select PITT-GAMING from this list. If the wireless MAC address for your Apple TV is properly registered with Pitt Information Technology, the connection should work and the unit communicates on the network. Select Internet Settings, then Connection Settings. Tap New Connection, Manual Setup, then Search for Access Point. The system performs a search of available network access points and displays a list of available networks. Select PITT-GAMING. If the wireless MAC address for your console has been properly registered with Pitt Information Technology, the connection should work and the unit communicates on the network. Select "System Settings" (the gear icon) from the home menu. Select Internet, then Internet Settings. The system will begin displaying available wireless networks. Select PITT-GAMING. Try pressing Y on your controller a couple of times to refresh the list of available networks if it does not initially appear. If the wireless MAC address for your Switch console has been properly registered with Pitt Information Technology, the connection should work and the unit communicates on the network. Power on the console. Press A on the remote to reach the main menu. Select the Wii Settings tile. Select the right arrow icon on the first "Wii System Settings" window to reveal additional choices. Select Internet, then Connection Settings. Select one of the available Connection Settings choices. Select Wireless Connection from the menu of your selected "Connection" entry (1, 2 or 3). Select Search for an Access Point. The console will prompt you to "Choose the access point you want to connect to." Select OK. Select Network Settings, Internet Connections (make sure the setting is "Enabled"), then Internet Connection Settings. Select the Easy setup option. The console scans for available wireless network and displays a list of available connection points. Select PITT-GAMING and press X. If the wireless MAC address for your PlayStation has been properly registered with Pitt Information Technology, the connection should work and the unit communicates on the network. Select Settings, Network, Set Up Internet Connection, Use Wi-Fi, then Easy. Select PITT-GAMING and press X on your controller. If the wireless MAC address for your PlayStation has been properly registered with Pitt Information Technology, the connection should work and the unit communicates on the network. Select Settings, System Settings, then Network Settings. Select PITT-GAMING. If the wireless MAC address for your Xbox is properly registered with Pitt Information Technology, the connection should work and the unit communicates on the network. Your Xbox should try to connect to a network as soon as it is powered on. Locate the PITT-GAMING entry from the list of available wireless networks and select it. If the wireless MAC address for your Xbox is properly registered with Pitt Information Technology, the connection should work and the unit communicates on the network. Select Settings, Network, then Set up wireless network. Select PITT-GAMING. If the wireless MAC address for your Xbox has been properly registered with Pitt Information Technology, the connection should work and the unit communicates on the network. While the PittNet Gaming Network offers a fast connection option for gaming consoles and smart TVs, other options enable access for units that do not have the capacity to authenticate to the University network. 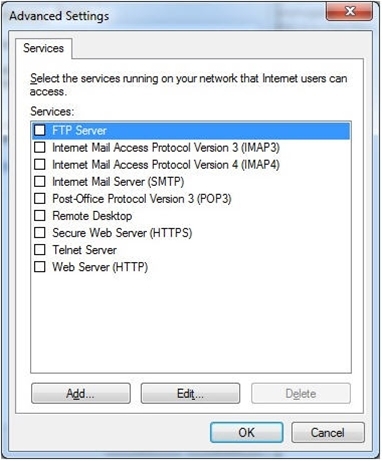 These procedures share the standard internet connection using a PC or laptop (through the room's data port, WIRELESS-PITTNET, or WIRELESS-PITTNET-FAST). These options involve additional hardware and may also require some assistance. Use the following instructions to configure your Windows computer to share the internet connection in your residence hall room with a gaming console or smart TV. Note: A crossover cable (sold at the University Store on Fifth) must be used instead of a normal Ethernet cable if neither of the adapters connected between the computer and the console are a Gigabit Ethernet Controller. Crossover cables are rarely needed. An additional USB Ethernet adapter may be needed if the console does not have one natively built-in. Ensure the Ethernet cable is connected from the wall network port to the computer. Plug the USB Ethernet adapter into an available USB port on the computer. Make sure the console is off. Connect the additional Ethernet cable from the USB Ethernet adapter to the network port on your gaming console. Note: Some antivirus programs may block necessary features for gaming consoles. Pitt Information Technology recommends that all users install Antivirus (Symantec Endpoint Protection) software and use the LiveUpdate feature to get the latest virus definitions. Symantec Endpoint Protection has been successfully tested with these gaming console instructions. Students, faculty, and staff can download Antivirus (Symantec Endpoint Protection) at no cost through the Software Download Service at My Pitt. Before installing Antivirus (Symantec Endpoint Protection), you must first uninstall any existing antivirus software on your computer, including previous versions of Symantec. Additional information about installing and configuring Antivirus (Symantec Endpoint Protection) for Windows is available. Windows 7: Click Start, then Control Panel. Windows 8: Click the Search icon from the tiled "Metro" interface > enter Control Panel > click the Control Panel line that should appear underneath. Windows 10: Access the Start menu by clicking the Windows logo, Settings, then Network & Internet. Click Network and Sharing Center. 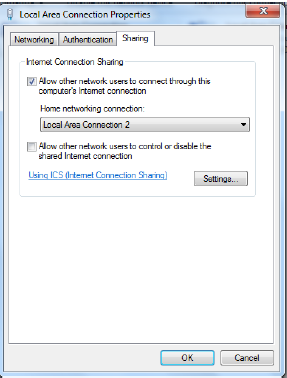 On Windows 10 systems, you will have to click Ethernet first in order to get to Network and Sharing Center. On the left-hand side, click Change Adapter Settings. Right-click the icon representing your built-in Ethernet adapter and click Properties. This is typically called Local Area Connection 1 or Ethernet 1. Click the Sharing tab and then select the Allow other network users to connect through this computer's Internet connection check box. In the drop-down box, specify the adapter that will receive the shared connection. This should be the USB Ethernet adapter connection (typically called Local Area Connection 2 or Ethernet 2). Uncheck the box labeled Allow other network users to control or disable the shared Internet connection. Click Settings to add new Services. An Advanced Settings window will pop up with various services. Click Add to add a new service. A window will pop up. Description of service: For reference only. It is recommended to include the port type and number for simplicity. 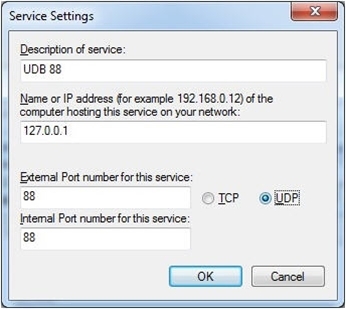 External Port number and Internal Port number: Enter the same port number for both values. This will depend on the gaming console. Please refer to the list of ports below. Click the TCP or UDP option. This will depend on the gaming console. Please refer to the list of ports below. Repeat this process for each remaining port for the console to be configured. Note: an error may appear if a port has already been added. 80 - TCP is often pre-installed as Web Server (HTTP) and 443 - TCP is often pre-installed as Secure Web Server (HTTPS). If these exist, highlight the entry, click Edit, and enter 127.0.0.1 under the Name or IP address box. Click OK to dismiss the Local Area Connection Properties window. Right-click the USB to Ethernet adapter icon, then click Properties. This is typically called something along the lines of Local Area Connection 2 or Ethernet 2. A window will appear. The Networking tab should be displayed by default. 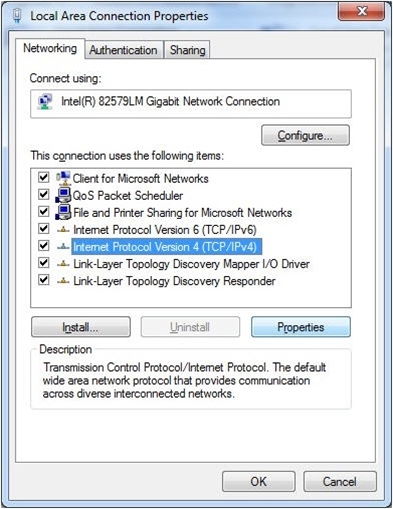 Click OK to dismiss the Internet Protocol Version 4 (TCP/IPv4) Properties window. Click the Authentication tab and uncheck the checkbox for Enable IEEE 802.1X authentication. Click OK to dismiss the Local Area Connection 2 (or similarly named) Properties window. Use the following instructions to configure your Mac computer to share the internet connection in your residence hall room with a gaming console. Use the link below to configure Boot Camp and Install Windows yourself. For this method, you will need to obtain a copy of Windows. Microsoft software for students is available via the Software Download Service at My Pitt. Alternatively, contact the 24/7 Help Desk at 412-624-HELP (4357) or submit a request online to schedule an appointment to have a consultant assist you with setting up Boot Camp. For this method, the consultant will bring a copy of Windows to install on your computer. Once Boot Camp is set up and Windows is installed, continue with the configuration instructions for Windows PCs found in the previous section. Instructions for configuring the most popular gaming consoles to use a shared internet connection in the residence halls are documented below. A USB LAN adapter compatible with the Nintendo Wii is needed to connect it to the Ethernet. The Wii does not have a built in Ethernet connection. Plug in a Wii USB LAN Adapter. Turn on your gaming console. Select the Wii button in the bottom left hand corner. Choose the Wii Settings box on the right. Find and choose Internet from the list. Choose a Connection that is not configured [Connection #: None] or overwrite one. Click the right arrow twice. Make sure Auto-IP Address has Yes selected. Click the right arrow for Auto-Obtain DNS. Choose No, then click Advanced Settings. Set Primary DNS to 136.142.57.10. Set Secondary DNS to 136.142.188.76. Choose Save and choose OK to test connection. Turn on the Playstation 3. Select Settings from the menu, and navigate to the Network Settings submenu. Once finished, a summary of settings will be shown. Press X on your controller to save the settings. The settings can be tested at this time. Turn on the Playstation 4. Access the Settings from the XMB, and navigate to the Network submenu. Choose Set Up Internet Connection, then press X on your controller. How do you want to connect to the network? : Choose Use a LAN Cable, then press X. How do you want to set up the Internet connection? : Choose Custom, then press X.
IP Address Settings: Choose Manual, then press X.
MTU Settings: Choose Automatic, then press X. Proxy Server: Choose Do Not Use, then press X. An internet connection test confirms connectivity. Turn on the Xbox 360. Choose System, Network Settings, Configure Network, Wired Network, then Configure Network. Navigate to the right tab–Additional Settings. Choose Restore to factory default and confirm when prompted. Navigate to the left tab–Basic Settings, choose IP Settings. 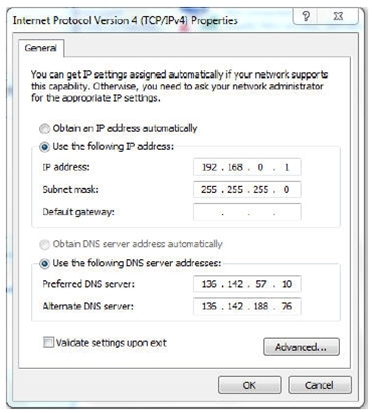 Under Basic Settings, choose DNS Settings. Press B on your controller to go back. Choose Test Xbox LIVE Connection. Xbox should connect to Xbox LIVE. An error regarding NAT may appear, but this can be ignored. Turn on the Xbox One. Access the Settings by pressing Menu on the controller, then press A. Select Network, then press A. Select Advanced settings, then press A. Press B, then select Test network connection. Xbox should connect to Xbox LIVE. If your computer is having difficulty connecting after sleeping, hibernating, or rebooting, undo the connection sharing on the main Ethernet adapter, then re-share the connection. The Help Desk at 412 624-HELP (4357) is available 24 hours a day, seven days a week to answer your technology-related questions. Questions can also be submitted online.